And you thought "American Idol" fans were excitable. They've got nothing on the millions of Arabs backing their national favorites on the show's Middle East knockoff. When the Lebanese frontrunner was eliminated in the semifinals last week, angry fans in the audience pelted each other with chairs or anything else they could find, and the two remaining contestants fainted. Scores of people took to the streets in Lebanon to protest. And when a 19-year-old Jordanian, Diana Karzon, won the crown in Monday night's finals of "Superstar," hundreds poured into the streets of the Jordanian capital, Amman, cheering, honking car horns, even shooting guns into the air, and fireworks illuminated main squares. 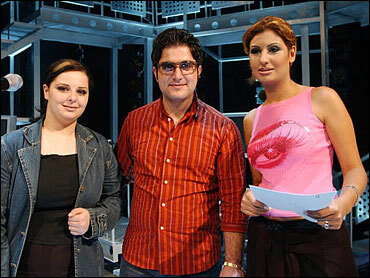 Karzon, holding hands with her 21-year-old Syrian rival Rowaida Attiyah in the show's tense final moments, burst into tears when the host announced the results. A total 4.8 million votes were cast via Internet and mobile text message before the final show. "Superstar," shown on the Lebanese satellite station Future TV mirrored its American counterpart — and the British "Pop Idol" that launched the concept — in many ways, including its huge popularity. Arabs across the region tuned in for the past 21 weeks, following as thousands of contestants from all Arab countries were winnowed down to 12 finalists from Algeria, Egypt, Jordan, Lebanon, Palestine, Syria and the United Arab Emirates. Contestants performed songs ranging from the classics of Lebanese diva Fayrouz and Egypt's Umm Kulthum, the most popular singer in the Arab world, to the hits of Arab pop. But while American Idol winner Ruben Studdard stirred local pride by wearing his oversized jerseys adorned with the number 205 the area code of his hometown, Birmingham, Ala. — contestants in the Arab versions moved whole countries. Karzon did not speak after winning — instead she belted out a rendition of an Arabic song, "Two Moons Standing At My Door" — but she said earlier that if she won she would dedicate the victory to "the people of Lebanon, Jordanians, on top of them his majesty King Abdullah and the children of Palestine." "Without any doubt, I am voting for Diana, because she is Jordanian and I support my country," said Tala Qassir, 23, a supporter in Amman. "Besides that, she has a nice voice and she deserves to win." Huge screens were placed in the streets of Jordanian and Syrian cities for people to watch the final, while posters on billboards and advertisements in newspapers urged people to vote for their singer. An ice cream shop in Amman promised free ice cream to people who vote for Karzon. A car company offered a 2003 sedan to the "most beautiful voice" on the show, according to an advertisement in Ad-Dustour, Jordan's second largest newspaper. A Syrian mobile telephone company hung posters in the streets of Damascus calling people to "vote for Rowaida Attiyeh. Give your vote to Syria." Jordanian and Syrian television stations aired special programs on Attiyeh and Karzon, treating them like national heroes. In Syria, merchant Subhan Elewi, 37, merchant said he voted for Attiyeh. "First because she is Syrian and second because she has a nice voice." Attiyeh and Karzon, unconscious, were rushed off the stage, and Future Television stopped the live broadcast. "This (program) is the most successful for an Arab television. There isn't a television program that moved the Arab world like that," said Ali Jaber, executive manager of Future Television. "All television stations now are scrambling to do something similar." Conservative groups say the show is yet another example of American culture infecting the Arab world. "We urge the concerned official and popular parties to put an end to this sad comedy, said a statement from the Islamic Action Front, part of the fundamentalist Muslim Brotherhood political movement. It said the show "facilitates the culture of globalization led by America to change the cultural identity of the people."